A sound installation consisting of a fully-functioning espresso bar. 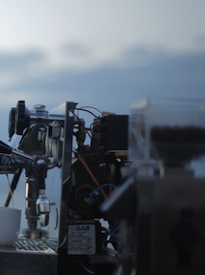 A barista who turns coffee-making into a live sonic experience. (And yes, you can actually drink your coffee after you've heard it). Contact microphones attached to all of the coffee-making equipment (espresso machine, milk jug, grinder, drip tray, water tank, espresso pump, etc). The resulting sounds are then amplified, fed through a laptop and subjected to subtle digital processing in real time. . Anywhere (both inside and outdoors). The electro-acoustic café can be set up from scratch in any location simply by bringing in the minimal coffee and sound equipment required. James Brewster, a former professional barista who has competed in 'Latte-Art', and came second in the 2010 Swedish Championships in Stockholm. He has also been working with sound for the past ten years.